Our kitchen renovation is finished! Hey guys! 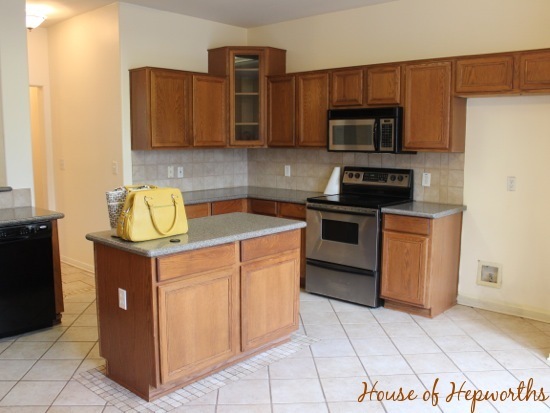 I am here to show you the final kitchen before and afters. We are pretty much finished with the renovation. We have small stuff to finish up (painting the baseboards, painting the walls, small random finishing touches), but for all intents and purposes, this renovation is D.O.N.E. And I couldn’t be any more relieved. We’ve never tackled a renovation of this magnitude, and although much of it was hired out, we did do a fair share of the work ourselves. Living in this chaos for the past 3 months has taken its toll on my sanity. We hired a local builder to oversee the project. He sent over each of his crews to do all the work, and then we paid each crew individually. This allowed us to squeeze in there and do as much work ourselves as possible to save money. Anyway, I’ll stop blathering on and on and just show you the money shots. We haven’t installed the under-cabinet lighting or tile yet. They will get wrapped up as soon as we have the funds and as soon as I’ve recovered from the trauma of this renovation and am ready to jump in and DIY something again. I don’t know what my favorite part of the new kitchen is. 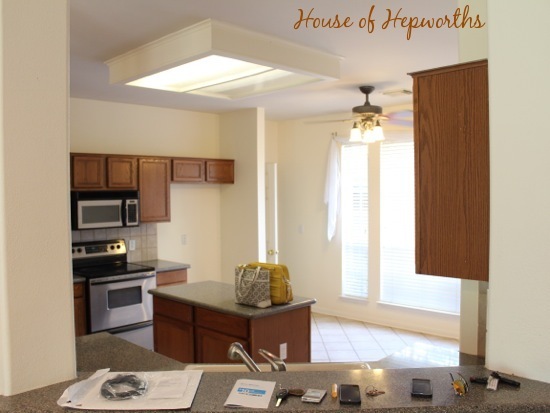 It’s a toss up between the desk area, those chunky shelves, the actual style and color of the cabinets, all the fun pull-out organizers… Honestly, I can’t pick a favorite part of the kitchen. I am just obsessed with every inch of it. White and two-tone (such as grey on bottom, white on top) kitchens are so popular right now, but I just really wanted a dark rich kitchen. I feel like this kitchen will stand the test of time and will still look fresh and current 5 years from now. White kitchens are classic as well, I just really love the look of rich dark cabinets. 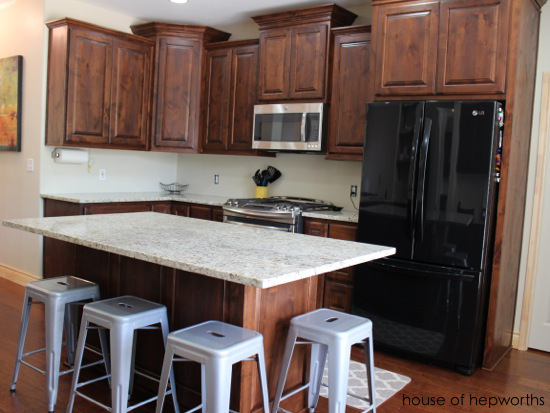 All the barstools and chairs are temporary until I find some that I truly love and go with this new style of kitchen. I love the industrial stools but I don’t feel like they really go with the look of the kitchen. Also, we now sit at this bar multiple times a day and those stools are not very comfortable. I’m on the hunt for new stuff but it will be awhile while we save up. Ah, the desk area… Desks in kitchens are so polarizing. Who would have thought? This one works for us though for a variety of reasons, the two biggest being a) we want the kids to enjoy their computer time out in the open so that we can keep an eye on them, and b) the desk is on a completely separate wall in the kitchen, so it’s in its own little area and doesn’t ever get junked up with kitchen stuff. I am 110% happy with our decision to put a desk in our kitchen. Between the island and the oven is where I spend the majority of my time while in the kitchen. Everything I need it at arms reach and it makes food prep so easy. I can prep a quick meal, then turn around and serve it to everyone sitting at the barstools. Here’s our sink area. It is the hardest working space in the kitchen. I chose a single-basin sink and was a little nervous about it, but I am now totally sold. I hate washing dishes in a split sink. Instead of another cabinet, I told the cabinet maker I wanted some open shelves. What he created is so beautiful. Seriously, I was expecting some thin shelves. These chunky ones take my breath away. I don’t know if you remember, but the bar behind the sink use to be bar-height and we dropped it to counter-height. This choice had me up with anxiety each night for weeks but as soon as the granite was installed and I saw the finished version, I knew I made the right decision. I love how open the kitchen is to the family room now. 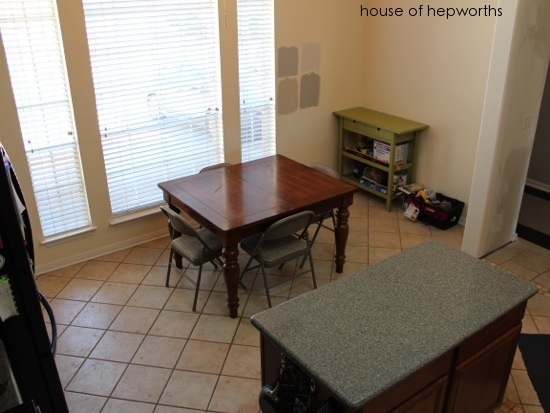 We also added cabinets in the dining room. I was going to build my own and even waxed poetic about it here, but Ben suggested we get the cabinet maker to do them so they all matched. Good call, Ben. We originally planned to have open shelving for the uppers but added doors as a last-minute plan change. I’m so glad we did because those cabinets are great storage! Pretty much all the chairs (and the table) are filler for now until we can upgrade everything to stuff that works better in there. For now though this situation works great for family dinners and game nights. I’m going to do several additional posts that break down individual areas and topics, but this post was so overdue I just wanted to quit the suspense and show you the whole area finished. If you have any questions please leave them in the comment section below. I know I sound annoying droning on and on about my love for this kitchen, but seriously. This is my favorite kitchen in the entire world and I now love my house more than I ever thought possible. Good thing because I am seriously never moving ever again! « Build a tire swing! Congratulations! Your kitchen, as well as the rest of your home, is gorgeous! I really wanted to change the footprint even more (move the plumbing, etc) but the price was escalating rapidly and those are huge expenses, so we decided to work with the layout that was already there but just make it better. I was sad for awhile about having to leave the columns next to the sink (they are support walls) but once I finally accepted them and worked them into the new renovation, everything feel into place. I now LOVE the layout and can’t think of a better way we could have done it. Oh, and I forgot I had a question. If this is too personal, please don’t be mad at me, but I’m curious about budget/finances and you have been so open about aspects of that. I know remodels can be expensive and I’m just wondering how this one has come out so far. I know one of the reasons for downsizing was to keep the finances in a great place, and this sounds like it will be your forever home and it is so worth it to make you love it, I’m just curious if the remodel was planned in that budget scheme, or just worked out as you went. We saved up for the renovation before we started, and we paid cash for the entire thing. We made a decent profit off the last house, plus the new one is quite a bit cheaper each month so we were able to save up fairly quickly. Oh, and Ben got a bonus at work that we threw in there. We did start with a budget but until you start tearing out sheetrock you never really know how much it will escalate. We found a few issues that we had to deal with that we weren’t planning on paying for. I’ve read (and I totally agree with this now) that when you get estimates for a big renovation, add about 20% additional onto the budget for unforeseen issues that come up. 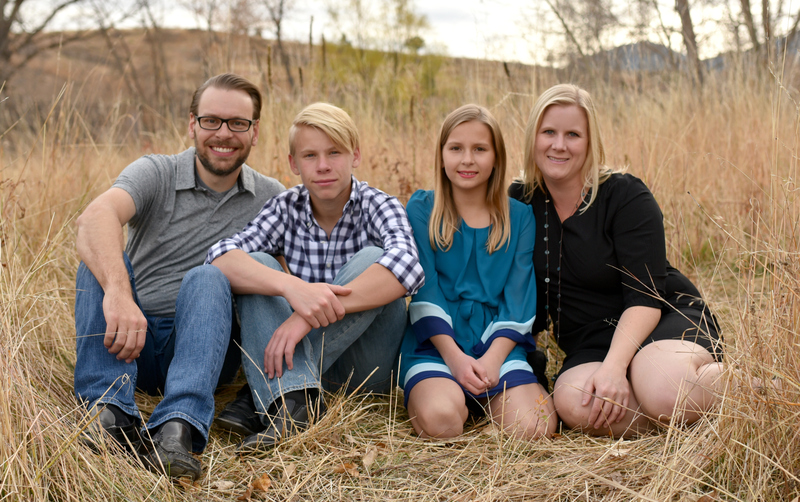 We ended up going about $9k over budget, but thanks to Dave Ramsey and our emergency fund we were able to still fund the renovation without going into debt. We now have to replenish our emergency fund though, so no more big projects until that’s paid back. I hope that answers your questions! If you have any more please don’t hesitate to ask. 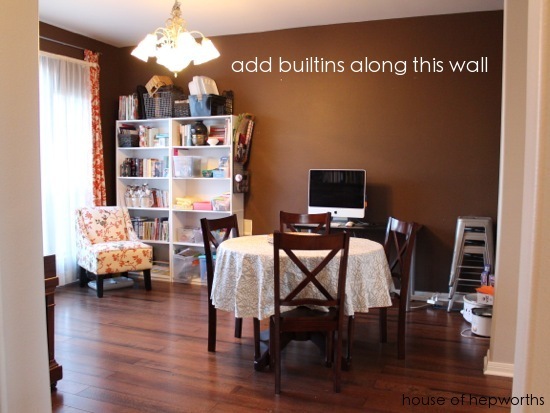 That desk area and the built ins in the dining room are BRILLIANT choices….must make life easier!! Our house flows so much better now. 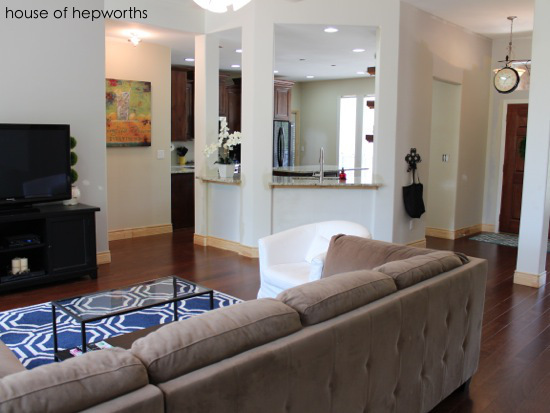 It’s really amazing what a little bit of storage and space planning will do for a family! We are still just totally shocked at how much better this house flows now. Everything has a place. 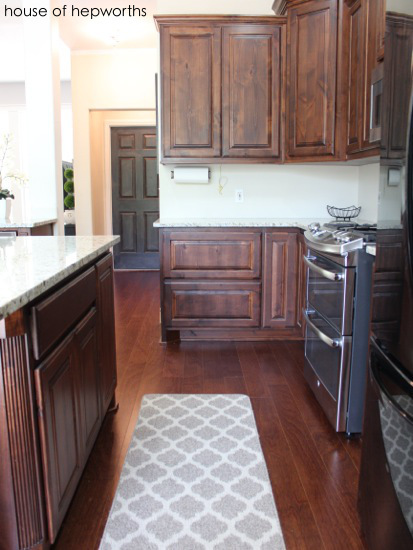 I love the wood stained cabinets! I get sooooo tired of white kitchens. I commend you on being true to yourselves and not doing what everyone else is doing in the blog world. 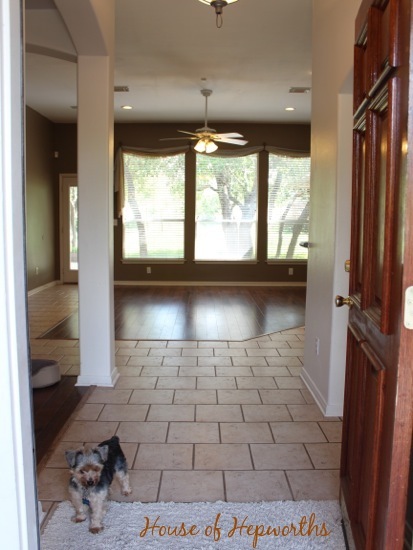 We just remodeled our home and changed all of our doors and baseboards from white to wood stained. I wish we would have done it years ago. I find it increasingly difficult to distinguish what I love from what I think I love because I saw it on pinterest last week. I’ve tired to really hone in on what I like and ignore all the static. Yes, my kitchen might be “safe” or “boring” to some people, but I’m not designing for the internet at large – I’m designing a space that my family likes that we will enjoy for years to come. If that looks boring or like a cookie cutter builder house, fine. It’s what I like! I love hearing that you are making decorating decisions based on what YOU love, not on what pinterest tells you you should love!! Stay true to yourself. 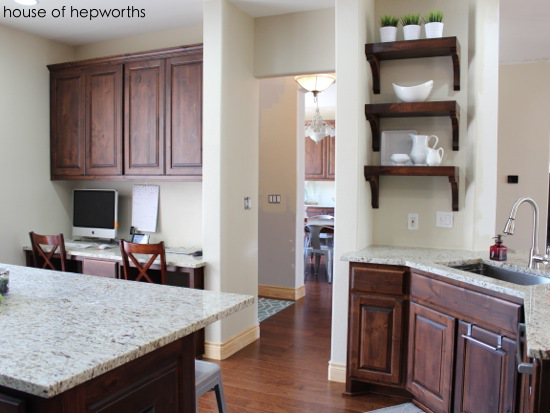 love, love, love the color of your cabinets– and all t ha storage is awesome! The AFTER turned out amazing. 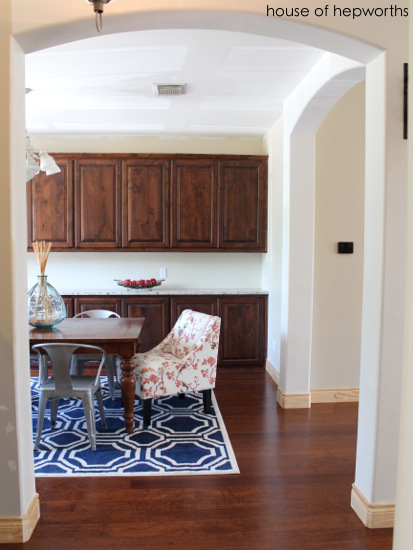 Thanks so much for sharing your remodel journey with us, I really have enjoyed following your progress. love the before-and-afters – great job!! Oh wow, it looks amazing! I am in love with the desk and chunky shelves as well. You definitely made the right decision on both! 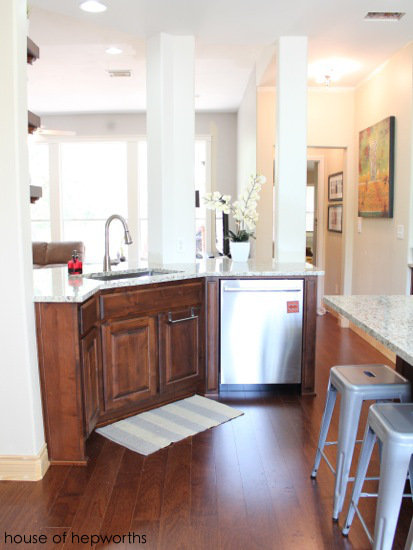 I’ve absolutely loved following your kitchen renovation and I can’t wait to read more. Great blog! What a great new look. The dropped counter looks way more open and the desk makes great use of wasted space. And I like the “keeping an eye on the kids” aspect of it. Big battles at our house over that one and having the “computer station/work zone” out front and center would put an end to that malarky. Enjoy your new space! Unfortunately for our kids (from their perspective, at least!) we are pretty strict. They do have iPads and DSs and the like, but never in their bedroom or game room. All electronics have to stay out in the open in either the living, dining, or kitchen. Also, we turned off their internet access on all their devices. If they want the internet we have to type in a password for them to get on the family computer. We will become less strict as they get older, but you really can’t be too careful with children and the internet these days. 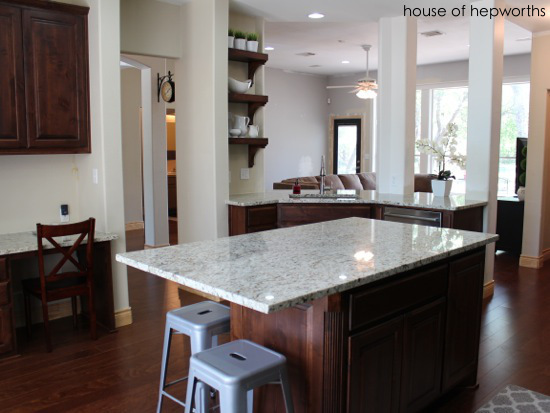 It looks fabulous, love the granite choice and your space planning, looks very polished AND functional! 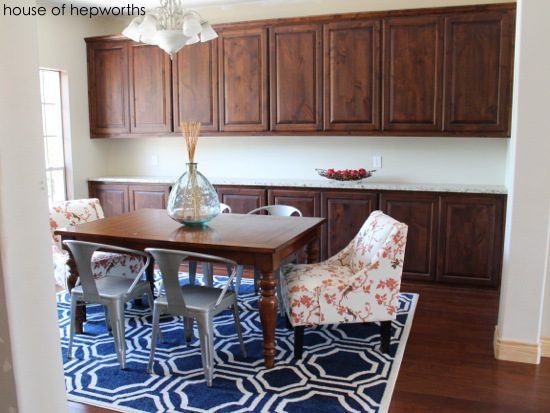 PS – where did you get those blue geometric rugs i LOVE them!! Thank you! The rugs I just bought at SAMS Club. Do you know they have HUGE rugs for only $99?! I know, right?! I usually play it super safe and get beige, but I just said, “what the hell!” and bought the blue ones. I didn’t want a beige rug on a brown floor, next to tan walls, and a brown couch. I love the blue!! The kitchen looks amazing! 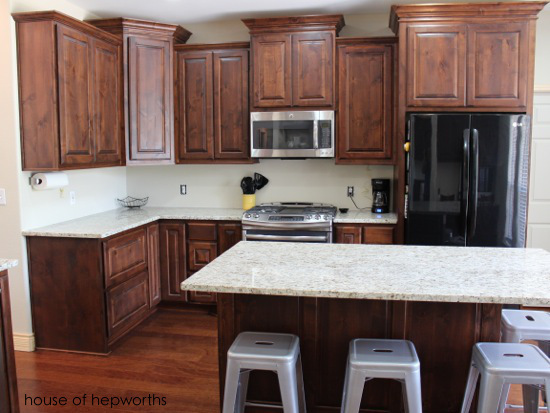 I love the wood you used for the cabinetry, it’s nice to see a natural wood kitchen pulled off so well! Thank you so much. I saw these cabinets (color, style, and type of wood) at another house the builder built and I insisted the cabinet maker do it again in mine. We added some additional depth and varying heights, but I already knew what I wanted based on a more simple version of a house already built. Your kitchen is beautiful! And your new floors make your house look twice as big. What a wonderful job you and your contractor did. The chunky shelves are perfect, too. 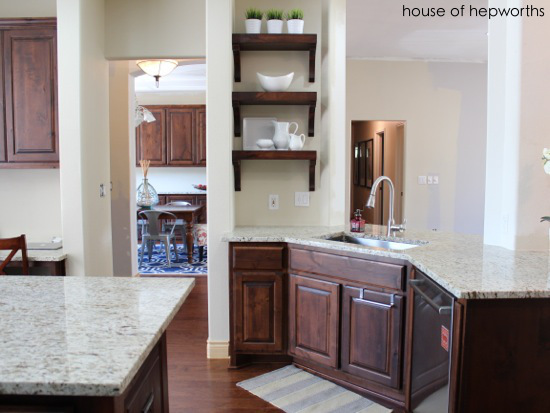 The cabinet in your before pic crowds that small space, but the floating shelves really fit. The desk in the kitchen is a great idea. Families tend to become more separated unless there’s some conscious effort to keep everyone in the same area of the home. And good for you & your husband for monitoring your kids’ computer use. 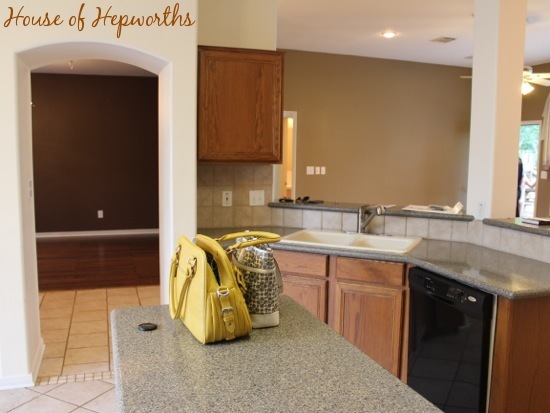 Beautiful cabinets in both rooms, and obviously incredible storage for you, too. Who cares if the chairs don’t match – when you’re eating in the dining room, you don’t see them anyway. Someday both you and I will have the chairs we really want (ha ha!). 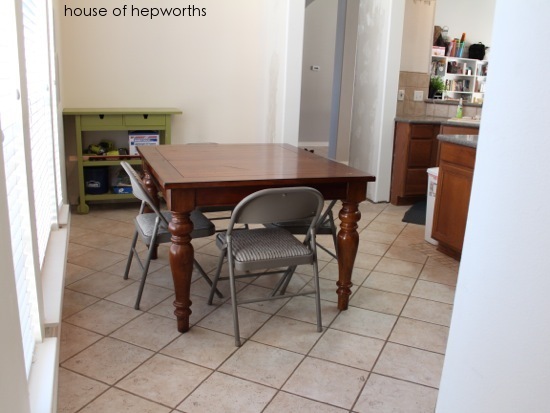 I would love new chairs, and eventually I do plan on swapping them out, but honestly, I already love the kitchen and dining room so much I can’t complain. It’s easy to look at pretty pictures of perfect spaces but real people don’t/can’t decorate like that. It evolves – a little purchase here, a furniture purchase there. Slow and steady. My house isn’t for a design blog — it’s a real house that a real family with a real budget actually lives in. And that means sometimes you live with furniture that doesn’t quite match. It looks really nice. 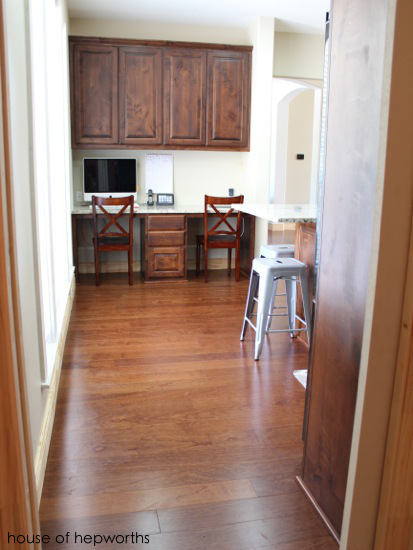 The floors alone are a huge improvement that I doubt I would have originally considered. 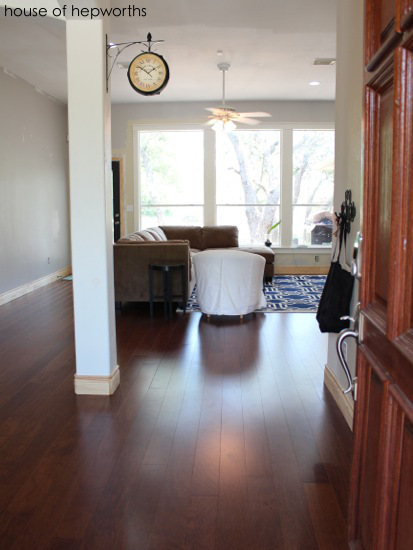 The tile looked fine, but the full hardwood looks great. Really opens it up. I also like the variations in cabinet height. Great job! We’re jealous. We need to do a major remodel but can’t quite get to the leaping off point yet. Thank you. I scoured many design magazines, kitchen remodel books, pinterest, design websites, etc for months before feeling comfortable enough to pull the trigger. The varying cabinet height was a joint decision with myself and the cabinet maker. I wanted a higher fridge surround and microwave cabinet. He suggested bumping up the corner one as well to add symmetry. I tried to design the space as best I could, but each of these professionals does this for a living, so I really took their suggestions to heart. It looks awesome! I bet you are relieved to have your house back to “normal”. 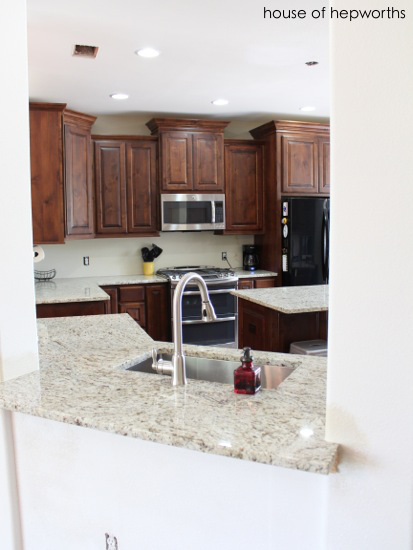 Are you planning on adding cabinet hardware? Yes, as soon as I can find something I like. I have been so indecisive! Jealous! But happy for you!! 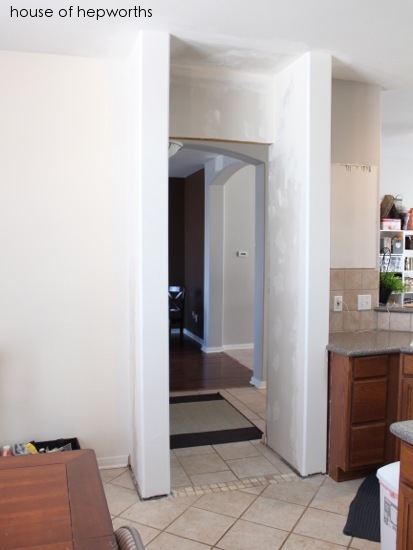 I’m sure I’ve told you….if you’re ever bored, go into my archives starting the summer of 2005 and read about our debacle of a kitchen remodel that ended up taking 10 months! Looks so good! 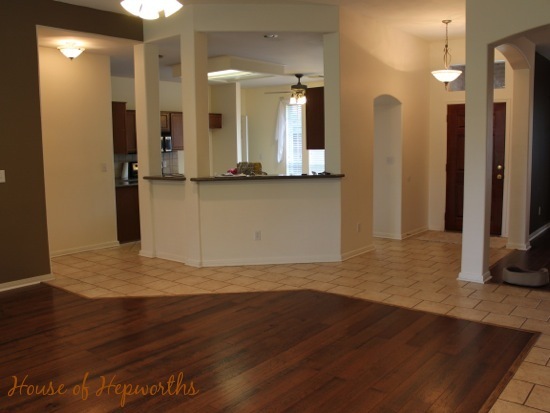 The difference between the before and after floors is my favorite. We did something similar in a previous house and it made everything look so much bigger and better! It took me a few seconds to figure it out, but I think you meant magnitude, not magnetite! Haha, yes, I did mean magnitude! I guess spell checker switched it on me or something. I have fixed it. Thanks for the heads-up. It was not fun at all living through this, but so worth it. Love it! It was great fun watching your process. Kudos for surviving the reno!! Hope you are enjoying the stunning results of your hard work!!! We love it so much! I now have miles of priming and painting trim and baseboards to finish up. Not looking forward to that! I’ll have to buy some knee pads since I’ll be painting on the floor so much. But we LOVE all the work we had done and I can’t even think of one thing we should have done differently. It works perfectly for our family. It looks amazing! I have the same color cabinets now and have been thinking of going with antiqued on the wall and dark island for the next house but this is making me really rethink that! Do you think the white or antique trend will end soon? This is SO gorgeous! Just beautiful. I, too, love the dark wood. Now, this is MY inspiration kitchen! Hi! Just finding your blog and perusing through 🙂 found this post with the gorgeous kitchen cabinets I’m looking for. Would you mind sharing the stain color? It’s so hard looking at samples and no one wants a dark kitchen anymore- hard to find ideas! I realize it’s an old post and no longer your kitchen!